Inspired by letters from a children's hospital requesting a visit by Captain Marvel, alter ego Billy Batson decides to make some wishes come true...but soon discovers that taking on rampaging monster robots and stopping volcanic eruptions are child's play compared to some struggles. Paul Dini and Alex Ross' critically acclaimed, classic tale is now back in this hardcover deluxe edition! SHAZAM! 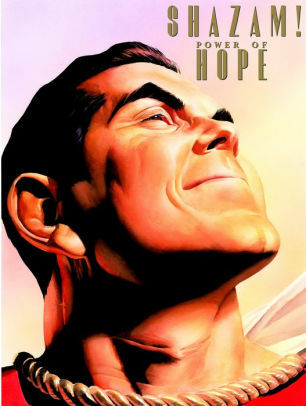 : POWER OF HOPE is a story of a superhero using his powers in the most human of ways, to instill hope in the hearts of children. When Billy Batson, Captain Marvel's adolescent alter ego, receives a letter from a terminally ill boy in the City's Children Hospital, he decides to spend a few days in the ward. A true kid at heart, Captain Marvel tries to shed some light in the children's lives by taking them on flying escapades and amazing them with stories of his exploits. Through amazing art and dynamic personal interaction, the true essence and innocence of Captain Marvel shines throughout this touching and emotional book. The star character of Spring 2019's highly anticipated film takes center stage here in this iconic tale.